The Big Picture: Zack is currently riding his bicycle from San Francisco, CA to South America. The “Tour de Zack”. Zack is very excited. 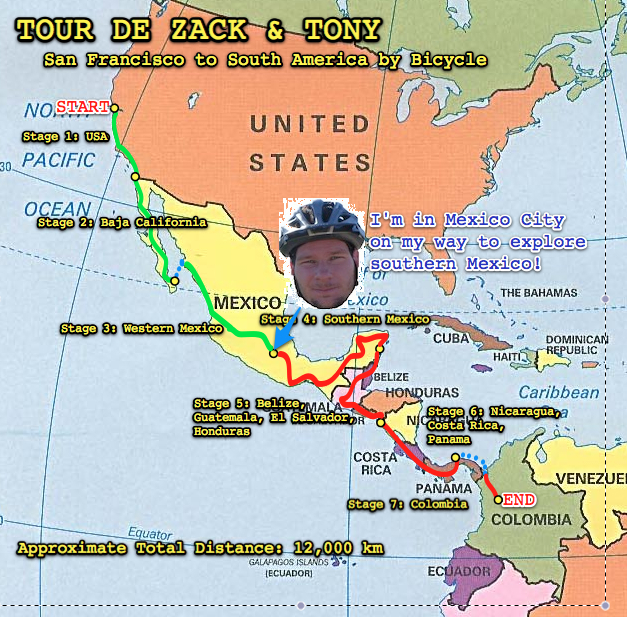 Zack and his trusty bicycle “Tony” are now in Mexico city about to continue their epic journey through Mexico! Over the next two months they plan to ride through Oaxaca, Chiapas, Yucatan, and Quintana Roo. Zack’s visa expires the end of June, so the clock is starting to tick! After arriving in Playa del Carmen at the end of Stage 4 of the Tour de Zack, Zack will probably fly to Cuba for a spell before continuing his journey into Central America and onwards towards Colombia! Now, there are a couple of things that may get in the way of this trip. First, as noted in an earlier ZackTracker, my sister and I have applied to be on the Amazing Race. If we make the next round of casting, I will have to return to the US in January/February, and if we make the show, I will have to leave the bike in May at the latest. Second, I’m on a shortlist for crewing a sailboat from Mexico to French Polynesia. If I get the spot on the crew I will need to leave the bike in early April. Third, I will likely be making a side trip to Cuba at some point. All of these possibilities are sounding pretty good. I will be following. Thanks!